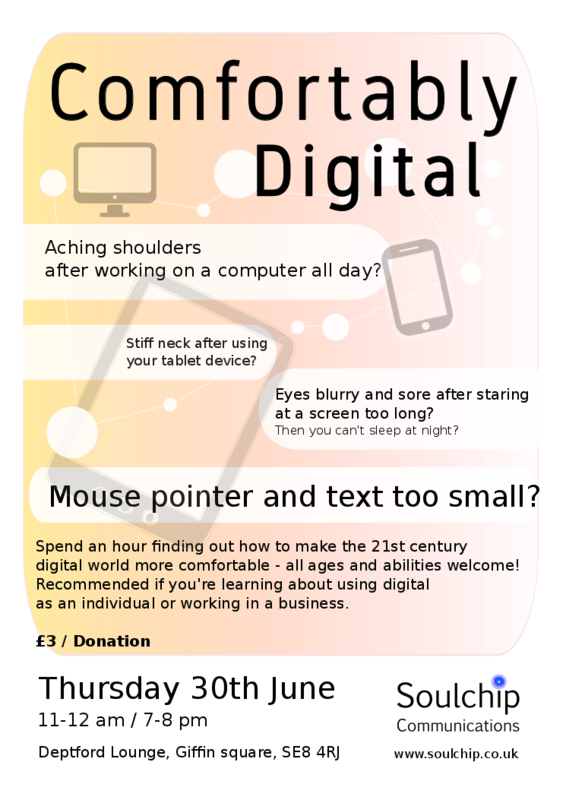 As part of my outreach in the quieter months of the summer, I’m hosting a couple of presentations to engage people using digital devices. Ergonomics and accessibility are words not used too much in general terms of using digital devices and computers, they tend to be reserved for when people first start attending a class to learn about using a computer. After the period spent learning and gaining confidence, the bad habits start to develop. These bad habits can cause discomfort and ongoing health problems – problematic if you’re working, already have ongoing health problems or needing to spend time in front of a computer to do a job search. I plan to show people some good posture and light exercise to help keep flexible, enlighten anyone on the accessibility options already available to make digital use less stress on the eyes and show off my laptop workstation. If you’re working for a lot of hours in front of a computer, learning to use a computer or need a reminder about the best ways of holding a tablet device, then I recommend a visit, and there is a hope I can get some locally made cupcakes to entice you further…there is a £3 fee or a nominal donation for the sessions, and like the flyer states, all ages and abilities are welcome, Deptford Lounge is wheelchair friendly too. You can download a flyer here.